Young People of Ireland…Are you there? With the news of a visit from Pope Francis being confirmed on Wednesday 21st, it has made a lot of people very happy. There are also a lot of people that couldn’t care less if it was the Pope or The Rolling Stones making an appearance. 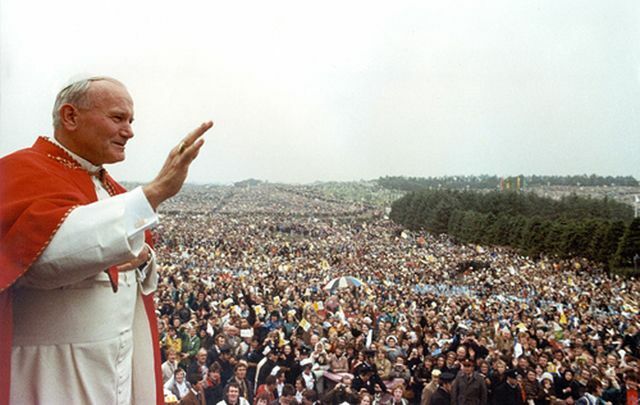 In September 1979 it is estimated that over 1million people took to the Phoenix Park to witness Pope John Paul II and nationwide it is estimated that 2.7 million (almost half the island’s population) came out to welcome him. With the latest census figures showing us that the number of Catholics are continuing to decrease it would be a surprise if the same numbers or even close to that turned out on the day. Ireland as a country and Irish society has changed so much since the innocent times of days gone by. All might not have been entirely innocent in the 70’s However, life in Ireland was more traditional, less diverse and most importantly to this topic a lot more religious. With the number of those entering the priesthood in St. Patricks college Maynooth believed to be at it’s the lowest entry since its foundation, the traditions of one son a guard and the other a priest are gone. Scandals have rocked the church and even though a lot has been brought to justice and brought into the public knowledge the church still comes under criticism such as former President Mary McAleese speech at the beginning of March. However when all is said and done whether your Catholic, Protestant, Muslim or Vegan a very Irish natural instinct is our curiosity. You may be Pope Francis’ number one fan or you may detest his beliefs but if you are Irish there is a strong chance that you could be standing next to one another in the Phoenix Park come August. As someone in the 20’s I admit I don’t go to mass, funerals and weddings is when I get my fix of confirmation and the same would be said for the majority of those my age group. We may have religious beliefs and we may pray but making sure we attend a timely mass has been overshadowed by late nights in Coppers and ‘foreign’ sports activities. To find out how my generation felt about a visit from Pope Francis I spoke to those in the 25 – 35 age group who have mixed feelings about the visit. Firstly I spoke to SIle Browne a young practising Catholic who would very much so welcome the news of his arrival. To hear a young 28-year-old mother making sure she attends weekly mass is a positive sign for the church in Ireland. As mentioned above myself personally and a good collection of my age group just don’t do the weekly visit, I found it much harder to find someone that does go to mass rather than someone that does not. As Sile says herself “We’re not living in the world we were living in forty years ago.” This is a fact, commitment to the Catholic church, multiculturism and traditions fading away have brought the numbers of mass goers down, but what will the numbers be like for when Pope Francis arrives? To find out how someone who has no interest in the news of the visit feels about it I spoke to Mark Carroll. With Mark been raised with a Catholic family, it is a distinctive perspective on the issue. He knows himself that he won’t be going anywhere near the Phoenix Park but he respects those that will. In his view, he doesn’t want to see any public money going towards one religions occasion and he will not be the only one arguing that point as Taoiseach Leo Varadkar has said the Government is at the Vatican’s disposal and “will assist in any way to facilitate Pope Francis’ visit”. From hearing opposite sides of the welcoming party. Mark has his view on this news and Sile has hers to get a real flavour of how those on the ground feel about it I took to the streets of Dublin to hear what the public had to say. Overall the response I found is mostly positive, for any event you will have fans and the not-so-much fans. Given our history as a country with our relationship with the church, there will be a lot of attention drawn to this. The good the bad and the inquisitive will be having a say about the visit especially with how much of a spectacle the last papal visit was. Maybe you will be getting the Tayto sandwiches, flasks of tea and red lemonade packed for a historic day or maybe you’ll be Netflix and chilling or out fishing without a care in the world. Whatever your choice on the matter you can be sure there is going to be lots of talk on this from now until then. Get ready for the collections with bursts of enthusiasm like something is coming down from above and the naysayers who list off scientific facts in disapproval.